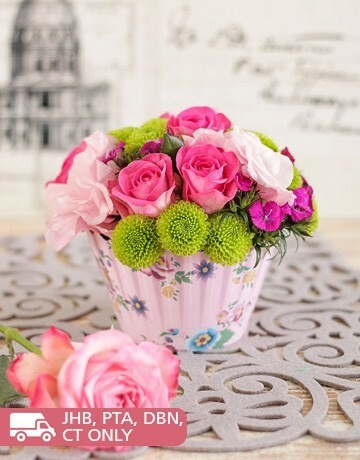 A sweet and lovable flower cupcake arrangement with pink roses that will make anyone’s heart bubble with joy! A cute posy style arrangement of pink roses, green button chrysanths and filler in a cheerfully patterned ‘cupcake paper’ container. The pink rose flower cupcake arrangement is the perfect Birthday, Secretaries Day, I Love you or anytime floral gift, with the icing on the cake being that your friend or loved one will be tickled pink!